This guest post on the 5 Major Events in Alaska You Need to See in order to have the best Alaska trip was written by my friend and Alaska lifestyle blogger, Laura Sampson. If you’re thinking about planning a trip to Alaska, you’re probably going to want to get the most bang for your buck. I know I would if I was spending all that money to travel from the Lower 48, our nickname for the contiguous states. You might want to consider making your big trip coincide with an event that makes Alaska special, we have a lot of unique things going on up here but these are my top 5 Major Events in Alaska You Need to See! Whale Migration: Gray whales have a long migration route, they spend winters in the Pacific off of the Baja of Mexico. They come through the gulf Alaska beginning in March and tapering off in April. There are a lot of cruises that take you to the whales such as Major Marine Tours and Kenai Fjords Tours. If you’re worried about harming or being too close to migrating whales there are very specific rules about how close you can be to a whale, when you can run your boat motor and when you need to just sit and let the whales do what they’re doing. Alaska State Fair: Voted one of the BEST 10 State Fairs in America this fair located in Palmer, Alaska. It’s something you shouldn’t miss if you’re going to be in Alaska in late August/ Early September. 10 days of fun, food, exhibits and especially World Record Giant vegetables. You’ve got to experience it to believe it. 4th of July in Seward: Seriously an ONE OF A KIND event in Seward, Alaska. This 4th of July party centers around a run called Mountain Marathon where participants literally RUN through town, UP Mount Marathon, back down and back through town. Other festivities include fireworks at midnight and an Alaskan Style Parade. Iditarod: Billed as the Last Great Race this IS the pinnacle race of distance dog sledding. 1049 miles from Anchorage to Nome on the western coast of Alaska. The start of the race is televised with mushers queuing up and racing through the streets of downtown Anchorage. For a price, you can even book a seat on a sled for the start of the race. Fur Rendezvous: Fur Rondy is a 10 day festival in late February that got it starts back in 1935, 24 years before statehood. It was originally a time for trappers to come to town and auction off their furs. Since then it’s grown and now includes, sprint sled dog races in the streets of Anchorage, a traditional blanket toss, the fur auction and so much more. As an added bonus I’m going if you’re here in the winter and you want the ultimate Alaska experience just head outside on a clear night and throw your head back. On almost ANY given night the Aurora Borealis will be painting the sky for anyone who wants to marvel that the world still holds such mystical beauty. If you’re wondering when and where to find the Northern Lights check out the Aurora Forecast from the Geophysical Institute. There you go, a born and raised Alaskan sharing great events for Cheechakos (new to Alaska) and Sourdoughs (longtime Alaskans) alike. Here’s hoping this list helps you plan that trip of a lifetime to Alaska. And remember in Alaska if you ever need help or directions just ask, we’re a small community in the biggest state, we watch out for each other. Now that you know what to do on your trip to Alaska, start getting getting everything ready with the packing tips you can’t live without! 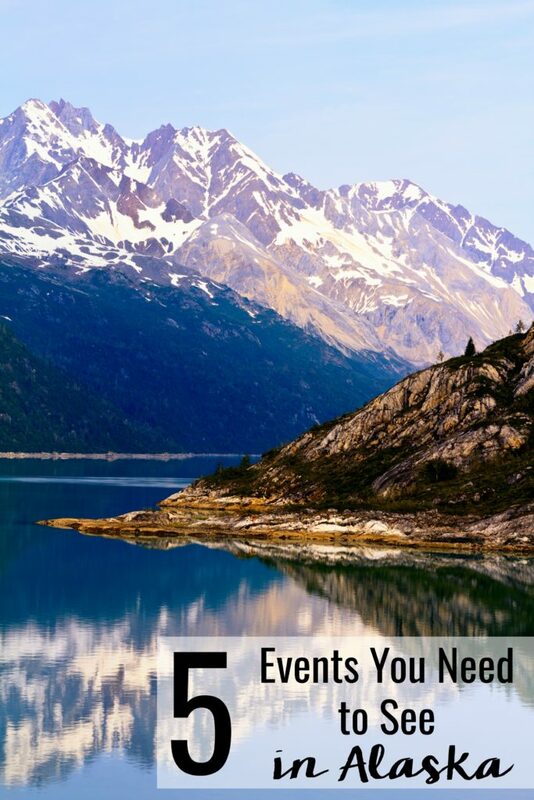 Make sure to pin the photo below with the 5 Major Events in Alaska You Need to See so you’re prepared for your upcoming trip!